"Our veterans have fulfilled their duty to our nation and now we must fulfill our duty to them," Trump said during a White House ceremony. "To every veteran who is here with us today, I just want to say two very simple words: Thank you." Trump repeatedly promised during the election campaign to dismiss VA workers "who let our veterans down," and he cast Friday's bill signing as fulfillment of that promise. "What happened was a national disgrace and yet some of the employees involved in these scandals remained on the payrolls," Trump said. "Outdated laws kept the government from holding those who failed our veterans accountable. Today we are finally changing those laws." Federal employee unions opposed the measure. VA Secretary David Shulkin, an Obama administration holdover, stood alongside Trump as the president jokingly suggested he'd have to invoke his reality TV catchphrase "You're fired" if the reforms were not implemented. The legislation, which many veterans' groups supported, cleared the House last week by an overwhelmingly bipartisan vote of 368-55, replacing an earlier version that Democrats had criticized as overly unfair to employees. The Senate passed the bill by voice vote a week earlier. Paul Rieckhoff, founder of the Iraq and Afghanistan Veterans of America, applauded the move, saying, "In a nasty, partisan environment like we've never seen, veterans' issues can be a unique area for Washington to unite in actually getting things done for ordinary Americans." The bill was a rare Trump initiative that received Democratic support. Montana Sen. Jon Tester said the bill "will protect whistleblowers from the threat of retaliation." The new law will lower the burden of proof to fire employees, allowing for dismissal even if most evidence is in a worker's favor. The American Federation of Government Employees, the largest federal employee union, opposed the bill. But the Senate-passed measure was seen as more in balance with workers' rights than a version passed by the House in March, mostly along party lines. The Senate bill calls for a longer appeal process than the House version — 180 days versus 45 days. VA executives would be held to a tougher standard than rank-and-file employees. 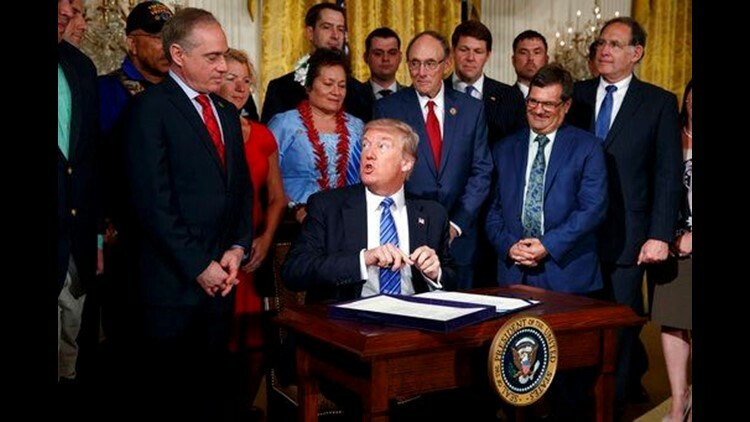 The bill also turns another of Trump's campaign pledges into law by creating a permanent VA accountability office, which Trump established by executive order in April. House Majority Leader Kevin McCarthy, a California Republican, called the bill signing "a significant step to reform the VA with a renewed purpose and ability to serve our veterans." "The ultimate goal is nothing less than a transformation of the culture within the VA so that our veterans receive the best care possible," McCarthy said.